Do you have a beautiful yard or ugly patches of brown grass? Your lawn sprinkler system is the key to a gorgeous, eye-popping landscape. You’ve seen it— patches of dead grass and the neighbor’s broken sprinkler head pouring gallons of water into the road and down the drain. What a waste. Is your sprinkler system wasting water too? Unfortunately, many irrigation systems are inefficient. Sometimes as much as half of the water delivered through the systems doesn’t benefit the intended plants. Atlanta Sprinkler Repair can help you solve these problems. Wet spots? Dry spots? Low pressure? Are your sprinklers not coming on at all? Will your sprinklers not turn off? We are at your service! Automatic lawn irrigation systems are a great way to keep your lawn looking lush and green in the long term. 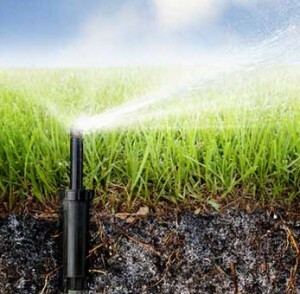 A good automatic lawn irrigation system will deliver exactly the right amount of water to your lawn, at the right time, without you needing to move the sprinkler or get out there with a hose to water the lawn yourself. These systems will keep your lawn looking great, will offer you the best in terms of time saving features and save water not only in Atlanta but all of Georgia.However these lawn irrigation systems require constant maintenance, including backflow testing. Note that an automatic lawn irrigation system does use both plumbing and electricity, so common sense and caution are the order of the day. However, they are not the same as household systems – the electrical lines carry low voltage, and the plastic pipes are easier to work with than household pipes. As long as you know how to use a multi-meter, you will be able to do a lot of repair work yourself. Automatic lawn irrigation systems have a controller, which sends signals to the valves located inside the control box. These valves open and close to direct water to different zones on the main line. This is what makes the sprinkler heads pop up and allows them to start spraying water. The most common issue with sprinkler systems in Atlanta is a broken sprinkler head. This is easily fixed by simply unscrewing the broken head to remove it from the riser, and then screwing a new head in place. You can do this with your hands, and should not need any special tools. A broken head is quite easy to identify – it will either simply not pop up, or it will have a visibly broken head which causes water to spray around wildly (or not spray at all). This kind of fault is quite common if the head is installed too high, allowing it to be knocked or damaged by a lawnmower or a passing vehicle. Another common issue is a clogged head. The Atlanta area has mostly clay soil which tends to clog sprinkler nozzles easily. This is different from sprinkler repair in Sanford Florida which has a sand based soil and you can learn more at /g/11gv1523jd. When a head gets clogged up with dirt, this will often mean that it rises and does not spray, or that it sprays weakly, but will not lower after spraying. To fix this, you will need to dig out the head and remove it from the riser. Take the head apart to remove it from its canister, and then clean the filter screen and the head itself. Once you have rinsed the whole assembly clean you can put it back together and reinsert it into the riser. If the head is a “rotor” (the kind that turns and throws water for a long distance) they often stop turning when they wear out. If they do stop turning they cannot be repaired, they need to be replaced. You may need to adjust the head to get the water to spray in a specific direction. There is usually an adjustable knob on top of the spray head that will allow you to do this. With rotors most require a manufacturer specific tool in order to adjust them. Repairing sprinkler solenoid valves is a bit more difficult. Atlanta homes tend to have strong water pressure so always make sure that the water supply is turned off (the sprinkler pump, irrigation backflow or water meter) before attempting any repairs. There are three main ways that irrigation valves fail; they won’t come on, they won’t shut off or they “weep.” As irrigation valves have two moving parts (a diaphragm and a solenoid plunger), sometimes the three problems have similar causes. Let’s look at them one at a time. 1. Faulty Solenoid: The solenoid could be mechanically or electrically defective or the plunger could be stuck in the closed position. 2. No Power to the valve caused by a broken wire, defective controller or bad wire splice. 3. Faulty Diaphragm: The diaphragm is frozen in the closed position. First, check the days, run minutes and start time on your irrigation controller to comply with County regulations. Next, walk each zone lookng for pipe and rotor + pop-up sprinkler head breaks. Clean irrigation nozzles as needed. Once all the leaks are repaired adjust your sprinklers so that you minimize run-off and over spray on hardscapes. Lastly, take a water hose and make sure your rain sensor works. The same mechanical parts as listed above can also cause the valve to stick open, only they have failed differently. Atlanta is known for lightning storms which often causes power surges which can damage sprinkler clocks.